Christine Evans, 66, of Hartford, passed away on Wednesday, January 16, 2019 at Owensboro Health Regional Hospital. 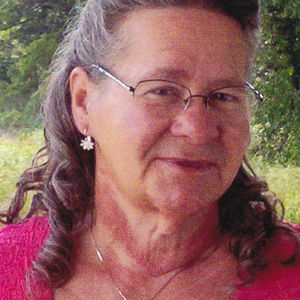 She was born May 24, 1952 in Daviess Co. to the late Columbus and Irene Harrison Dennis. Christine was a homemaker, a very loving wife and mother, and enjoyed going to garage sales and flea markets. She also loved raising flowers and spending time with her four dogs, Mehi, Jackie, J.T., and Little Man. She was also preceded in death by brothers, Willie Dennis, Charles C. Dennis and his partner Margie Sutton, Jessie Dennis, and Russell Wayne Dennis, a sister, Shirley Keller, and a sister-in-law, Lois Dennis. Surviving are her husband of 29 years, James "Ronnie Bear" Evans, two daughters, Pearl Westerfield and husband Larry of Hartford and Peggy Smith of Wisconsin, two granddaughters, Chelsey Trogden and Roxanne Gifford, a brother, Robert Dennis of Utica, a sister, Rebecca Daugherty and husband William of Owensboro, a sister-in-law, Rachal Dennis of Owensboro, a special friend, Anita Smith of Beaver Dam, and numerous nieces and nephews. The funeral service for Christine Evans will be Noon Monday, January 21, at Glenn Funeral Home and Crematory. Burial will follow in Rosehill Cemetery. Visitation will be from 9:00 A.M. until Noon Monday at the funeral home. Memories and condolences for the family of Christine Evans may be shared at www.glenncares.com.